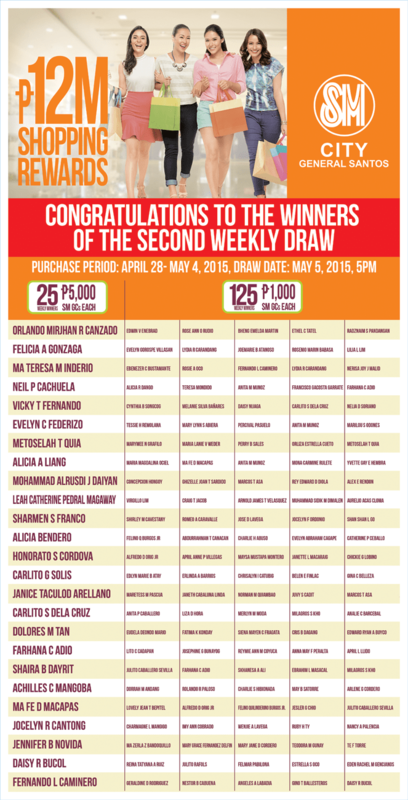 Here’s the latest LIST OF WEEKLY WINNERS of SM City Gen. Santos’ P12Million Shopping Rewards! [dropcap]A[/dropcap]lmost three weeks ago, SM City General Santos launched their weekly P12 Million Shopping Rewards promo. This amazing promo is drawn weekly and gives away Gift Certificates worth P5000 each to 25 lucky winners and P1000 each to 125 weekly winners! And guess what, this is exclusive to SM City General Santos only. 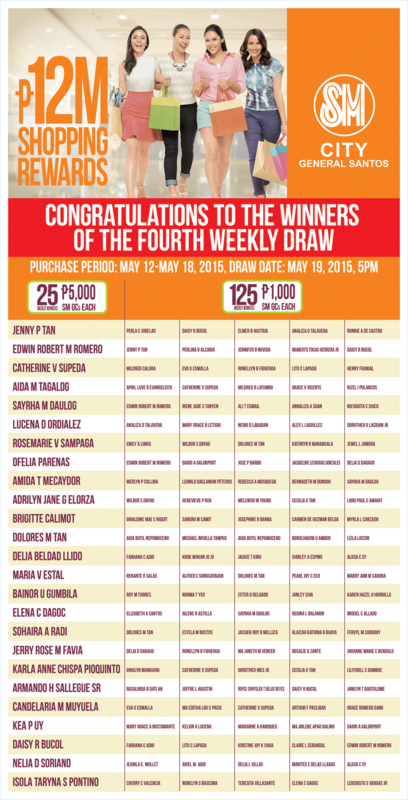 Since it started, SM City General Santos has already drawn two weeks worth of winners. And in relation to that, we are giving you their names. Here then is the list of winners during the First Week Draw. Purchase Period: April 21-27. Draw Date: April 28, 2015, 5pm. 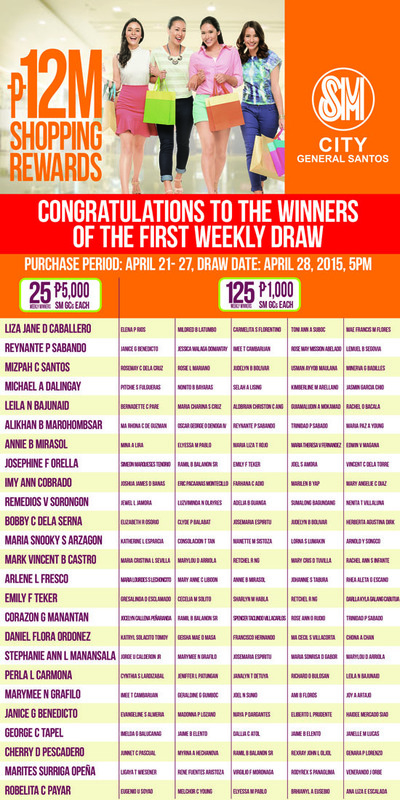 Here is the list of winners during the 2nd Weekly Draw. Purchase Period: April 28 – May 4. Draw Date: May 5, 2015. For the 3rd Weekly Winners, here is the list. Purchase Period: May 5-11, 2015. Draw Date: May 12, 2015. 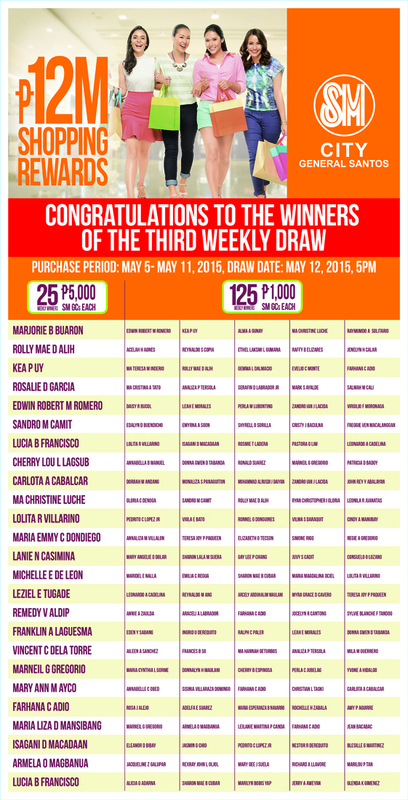 And for the list of the winners of the 4TH WEEKLY DRAW for May 2015, check below…. 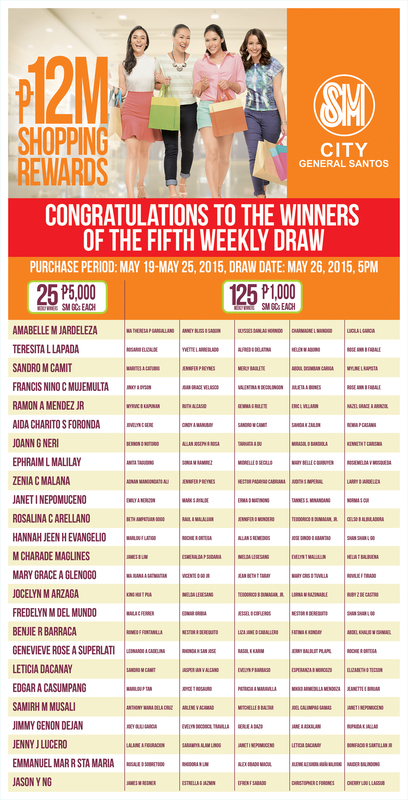 Next is the 5th Weekly Draw Winners! PURCHASE PERIOD: May 19-25, 2015. DRAW DATE: May 26, 2015. Here are the winners of the 6th Weeky Draw! PURCHASE PERIOD: May 26 – June 1, 2015. DRAW DATE: June 2, 2015. 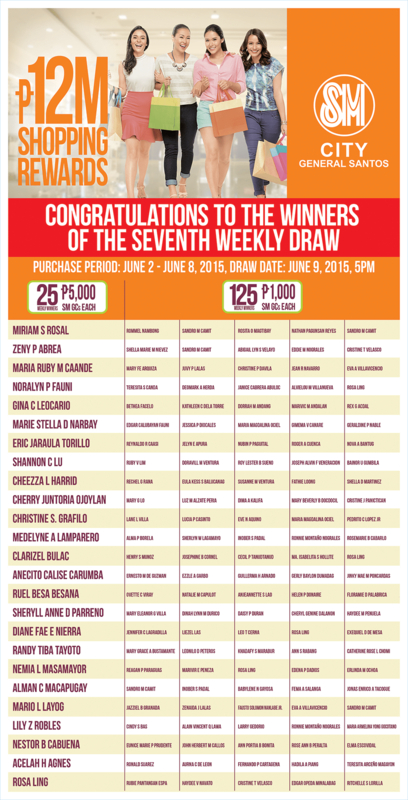 For the 7TH WEEKLY DRAW, here are the winners. PURCHASE PERIOD: JUNE 2- JUNE 8, 2015. DRAW DATE: JUNE 9, 2015. 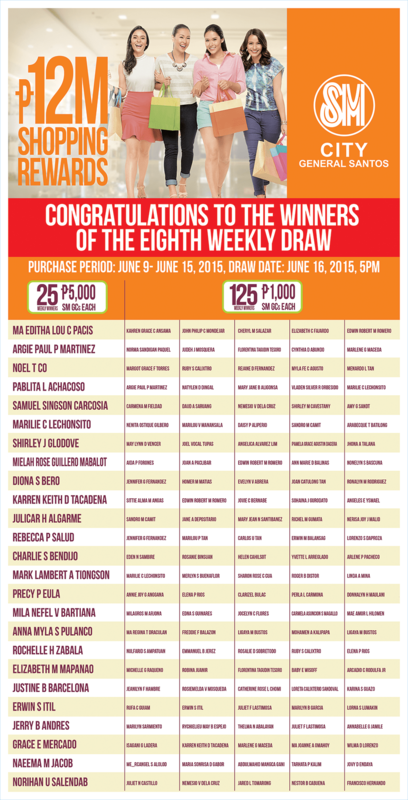 Here are the 9th Weekly Draw Winners. Purchase Period: June 16-22, 2015; Draw Date: June 23, 2015. 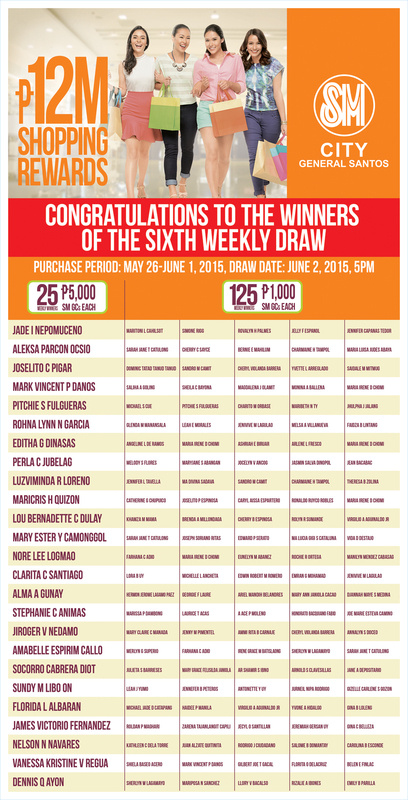 Up next is the list of the 10th WEEKLY DRAW WINNERS. PURCHASE PERIOD: JUNE 23-JUNE 29, 2015. DRAW DATE: JUNE 30, 2015. Congratulations to all the winners of this windfall from the 1st to the 10th weekly winners!!! Check back for future Weekly Draw Winners List. Who knows? You might be one lucky shopper soon! And do keep on patronizing SM City General Santos’ P12 M Shopping Rewards.